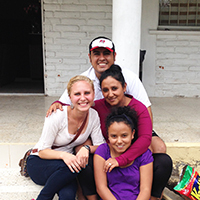 Experience Ecuador with Spirit volunteers through our blog! All of our scholarship recipients document their volunteer experiences through a travel blog - experience Ecuador through their weekly blog posts each summer! Audrey O'Connell, of Downers Grove, Illinois, studies graphic design with a minor in Spanish at Loyola University New Orleans. Her goals for her time in Ecuador were to gain a better understanding of different cultures and improve her Spanish speaking abilities. While studying at Loyola University New Orleans, Audrey is project leader for Loyola's community service club. After she graduates she hopes to do something in the graphic design field that supports travel and volunteer work. Molly Finnelly, of Lemont, Illinois, is a social work major at Illinois State University. She volunteered at Fundacion A.B.C. senior center in Quito, Ecuador, utilizing her skills with local residents in need of a meal and socialization. 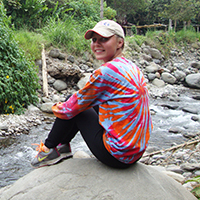 Click here to read a news article published about her Ecuador experience! Mackenzie Hedge, of Big Lake, Minnesota, is a nursing and Spanish major at Concordia College in Moorhead, Minnesota. She volunteered at Fundacion Medica Mosquera, a health center in the old town of Quito that provides assistance to people with limited financial resources. Rita Hess is a Spanish Linguistics and Pedagogy master’s candidate at Illinois State University (ISU). She served on the executive board of ISU’s Sigma Delta Pi chapter (Spanish Honor Society) as secretary and has over 150 hours of community service and outreach. Hess studied abroad in Granada, Spain and has taught English as a second language to 120 students from Mexico through a university program. Hess completed a week of advanced Spanish lessons in Quito before spending two weeks volunteering at a girl’s orphanage in Cuenca. She aided in organizing recreational activities for the children, helping with their homework, and helping them in developing life skills. When asked her motivation for participating in this project, “I am honored to take my advocacy from the community level to an international stage, helping inspire these girls to fulfill their dreams and push through the hardships they face,” said Hess. Alex Elizarraga also took one week of advanced Spanish lessons before volunteering for three weeks at a summer camp for school-aged children. 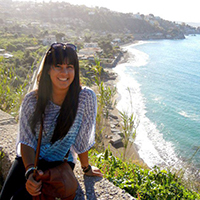 Elizarraga graduated from Concordia College with a BA in Psychology and Spanish in 2015. On campus, he served as president for the Concordia Swim Club and debate captain for the Concordia Forensics team. In his free time, Elizarraga volunteered as an elementary Spanish teacher for youth. During college he was active in his local community as a camp counselor, private Spanish tutor, and small group leader for various organizations. 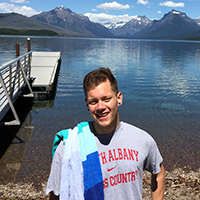 He aspires to become a high school counselor near his hometown in Oregon. “Many countries consist of people like my dad, who had to drop out at age 9 in order to work. I want to make a difference. I want to be the support that I was fortunate enough to receive,” said Elizarraga. Danielle Slowik was a student attending Valparaiso University working to obtain her Bachelor’s degree in Theology, Global Service and Humanities (with a minor in TESOL) when she received our 2014 scholarship. She has hopes of teaching English abroad and serving overseas with a national service program after graduation. 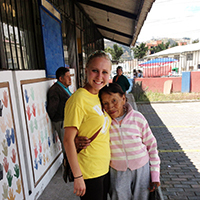 In 2014, Danielle participated in Spirit's Volunteer Abroad Program and traveled to Quito, Ecuador to volunteer at a Senior Center, Abuelitos de Calle. The following year, Slowik interned for Spirit and advised our 2015 scholarship recepients prior to their departure for Ecuador.